Joshua was one of the first to arrive at the foundation. 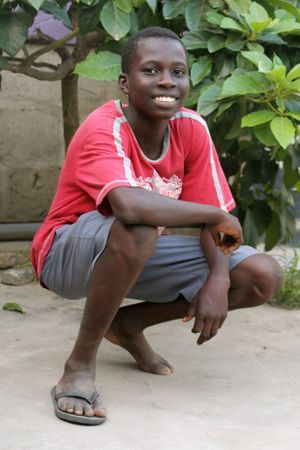 His mother could not afford to care for him so he was living with his aunt in Kasoa. Patrick found him on an American Farm where they grow oranges. He was poorly and Patrick questioned why he was not attending school. He visited the aunt. According to her the father's whereabouts are unknown and he is the youngest of three siblings. Unfortunately we are unable to trace them. When Patrick discovered Joshua, the aunt's husband had just become paralyzed and they could no longer care for him. He was brought here in June 2011 and he is happier here than he was before. He loves playing games like Ludo, basketball and football and he says his favourite food is, and always will, be jollof rice! When Joshua grows up he wants to be a bank manager.